Summer Dance Classes - Now registering! You won’t find another studio like JubalArts anywhere in the Greater Lansing area. The difference is simple. We pursue excellence in dance and music technique in order to better communicate love to our Heavenly Father and life to other people through our artistic expressions. Whether we are in the classroom or onstage, all we do is for the glory of Jesus Christ. JubalArts has been open since 2006, offering a variety of dance classes for each age group throughout the school year and during part of the summer. Come experience the joy and creativity at JubalArts for yourself. Our mission is to glorify Jesus Christ in the classroom and on stage. We begin each class with a weekly scriptural devotion and prayer. Students make connections between dance and their Creator and have opportunities to use dance to express their faith during the school year in the classroom and in the community. Each year, students have at least one opportunity to take the love of Christ into our city through a community dance performance at a local retirement community. We are always so blessed by the joy that we have in meeting people in our city and sharing what we’ve been learning in the classroom! While growing up, Natalie Simpson studied a wide range of dance styles including ballet and pointe, contemporary, jazz, lyrical, musical theater, and flamenco. After high school she attended Arts Triumphant Dance Conservatory in Jacksonville, FL, training with Yvonne Salcedo-Williams, former ballerina with the Pittsburg Ballet, studying ballet and pointe, modern, jazz, lyrical, Latin, character, and choreography and improvisation. While earning her B.A. in music at Hillsdale College she studied ballet and modern with Melissa Beck-Matjias (University of Michigan Dance Faculty) and Jovita Weibel (Peter Sparling Dance Company). During the summer of 2010, she attended the Horton Pedagogy Workshop with Ana Marie Forsythe at the Alvin Ailey School in NYC. Most recently, she has studied hip hop with... read full bio. Brittnie Scott (Miss Scotty) teaches Hip Hop 1 & 2, Lyrical, & Jazz 2 & 3. She is engaging in the classroom, pushing each of her students to reach their fullest potential in God and their dancing! For Brittnie, her relationship with Jesus and dance are inseparable! With a powerful and moving style, Brittnie's dancing will bring you to tears and simultaneously moves your heart for more of Jesus with her passion and power. 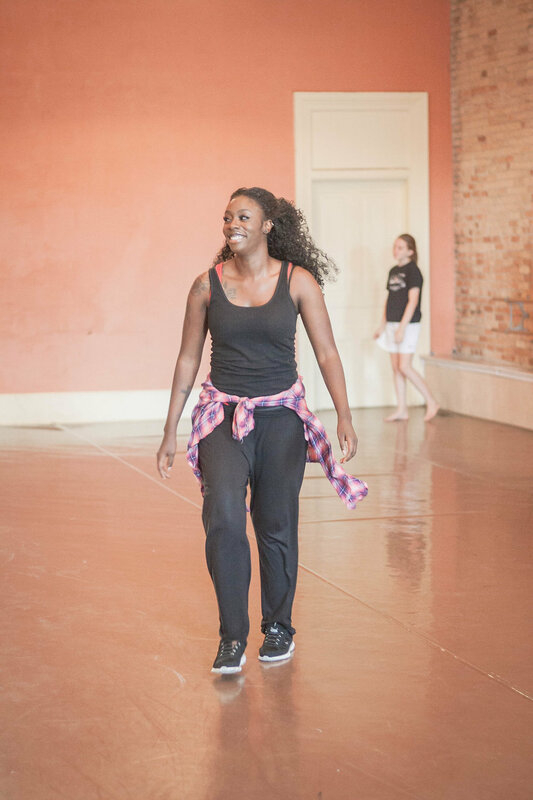 Brittnie brings over ten years experience to the classroom, having directed and led groups of dancers in a variety of dance and theatrical productions, using predominantly jazz, hip hop, lyrical, contemporary ballet, and African dance styles. Brittnie is a gifted and sought-after teacher and choreographer, and her students absolutely love her! Expect to be stretched, challenged, and cheered by Miss Scotty in each and every class you take with her! Rebecca loves singing, dancing, and playing the piano and ukulele. She enjoys teaching piano and ukulele lessons and has placed first in her level three years in a row in the Piano Student Achievement Testing at MSU. She has studied ballet for four years and contemporary for three years. A few of the performances Rebecca has been in include seven musical theater productions with a local theater company as well as The Lion, the Witch, and the Wardrobe with Reflections of Grace in Grand Rapids. She is currently working toward her associate degree to become a veterinarian technician. Rebecca is thrilled to be teaching ballet again this year and is excited to share her love of the Lord with her students.